Well, now that most of my classes are over, I guess that it is time to start writing again. A couple days ago, Holly and I decided to get ourselves a new 2009 Kia Optima and I must say, I love this car. Wordpress is being stupid so pics are up at my flickr page. 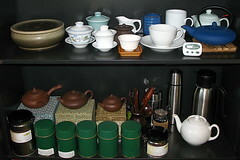 According to a preliminary study, chances of oesophegeal cance could increase from drinking tea over 150F. Hopefully there will be more studied done to find out if it is just tea, or all hot drinks. AT&T Got Something Right for Once... Well, Half Right. Recently, the RIAA announced that they were abandoning their litigation campaign against random Americans. Thousands of thousands of college student voices rejoiced and then were suddenly silenced. The RIAA immediately proceeded to try to get ISP's to do the job of the legal system. After ATT, Cox, and Comcast decided to work with the RIAA to enforce their allegations of infringement and sidestep due process, the future of the internet looked grim. Thankfully, even though ATT is forwarding the RIAA's legal notices, they stress that "there are no sanctions." Though it isn't a good thing that ATT is forwarding legal notices, at least they aren't becoming judge and jury.